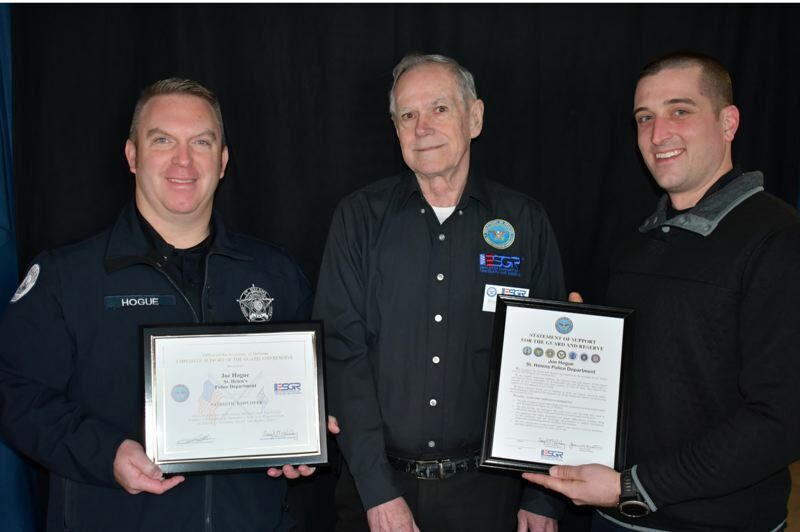 St. Helens Police Department Lt. Joe Hogue, left, was recently presented with a Patriotic Employer award by the Department of Defense's Employer Support of the Guard and Reserve program. Hogue was nominated for the award by SHPD officer and Oregon Army National Guard member Anthony Boswell, right. The award is granted to recognize employers who contribute to national security and the protection of liberty and freedom by supporting employee participation in the United States National Guard and Reserve Force, a press release states. Pictured from left to right are Hogue, ESGR volunteer Bruce Thompson, and Boswell.